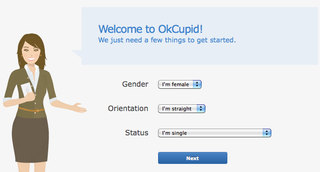 OkCupid is through tainting its pool of attractive members with all you degenerates out there. So this week, the dating site sent an exclusive email to the "top half" of its most attractive users. With hot person privileges galore! This new status won't affect your actual match percentages, which are still based purely on your answers and desired match's answers. But the people we recommend will be more attractive. Also! You'll be shown to more attractive people in their match results. This isn't the first time a dating company has tried to filter its fatties, and OkCupid does insist that you'll still be matched according to what you're looking for on the inside. Just as long as the outside is also up to par. BeautifulPeople Dating Site Kicks 5,000 Members Off For "Letting Themselves Go"